30-378 Weatherby ammo is an amazing cartridge with an unusual history. It was initially developed by Roy Weatherby under a military contract seeking to design an anti-personnel and an anti-material round. 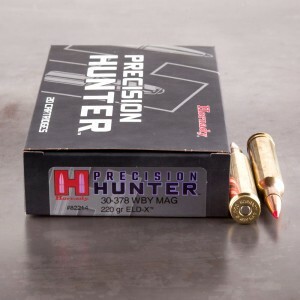 Designed in 1959, some 14 years after Roy Weatherby opened shop to produce some of the world's best new rifle rounds, the 30-378 Weatherby went on to become one of the fastest .30 calibers around! It is based on Weatherby's fine .378 Weatherby Magnum case necked down to hold a .308 inch bullet. The round quickly garnered numerous records even before it was offered to the public - surprisingly, that offering didn't come until 1996! Initially, the military had requested a .30 caliber round able to produce on the north side of 6,000 feet per second with light 80 to 100 grain bullets using various alloys while attempting to duplicate shrapnel velocities. Using special propellants, the .30-378 Weatherby Magnum exceeded the military's specs. The round is inherently very accurate; it held 1,000 yard accuracy records for over 30 years. Today's factory offerings usually use 180 grain bullets pushed out of the barrel at close to 3,400 feet per second! This is a very well made product in every aspect,especially in the ability to get several re-loads out of the brass. The 220 grain projectile hits very hard, causing virtually instant deformation, and wound tracts. It evenly distributes lethal energy with such efficiency, a follow up shot has never been required. Elk & Moose drop with in seconds of the trigger squeeze, and have always exited for what are likely near instant kills.